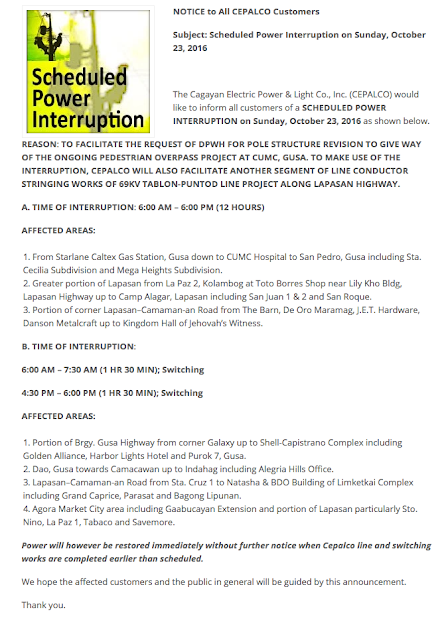 The Cagayan Electric Power & Light Co., Inc. (CEPALCO) would like to inform all customers of a SCHEDULED POWER INTERRUPTION on Sunday, October 23, 2016 as shown below. REASON: TO FACILITATE THE REQUEST OF DPWH FOR POLE STRUCTURE REVISION TO GIVE WAY OF THE ONGOING PEDESTRIAN OVERPASS PROJECT AT CUMC, GUSA. TO MAKE USE OF THE INTERRUPTION, CEPALCO WILL ALSO FACILITATE ANOTHER SEGMENT OF LINE CONDUCTOR STRINGING WORKS OF 69KV TABLON-PUNTOD LINE PROJECT ALONG LAPASAN HIGHWAY. 1. From Starlane Caltex Gas Station, Gusa down to CUMC Hospital to San Pedro, Gusa including Sta. Cecilia Subdivision and Mega Heights Subdivision. 2. Greater portion of Lapasan from La Paz 2, Kolambog at Toto Borres Shop near Lily Kho Bldg, Lapasan Highway up to Camp Alagar, Lapasan including San Juan 1 & 2 and San Roque. 3. Portion of corner Lapasan–Camaman-an Road from The Barn, De Oro Maramag, J.E.T. Hardware, Danson Metalcraft up to Kingdom Hall of Jehovah’s Witness. 1. Portion of Brgy. Gusa Highway from corner Galaxy up to Shell-Capistrano Complex including Golden Alliance, Harbor Lights Hotel and Purok 7, Gusa. 2. Dao, Gusa towards Camacawan up to Indahag including Alegria Hills Office. 3. 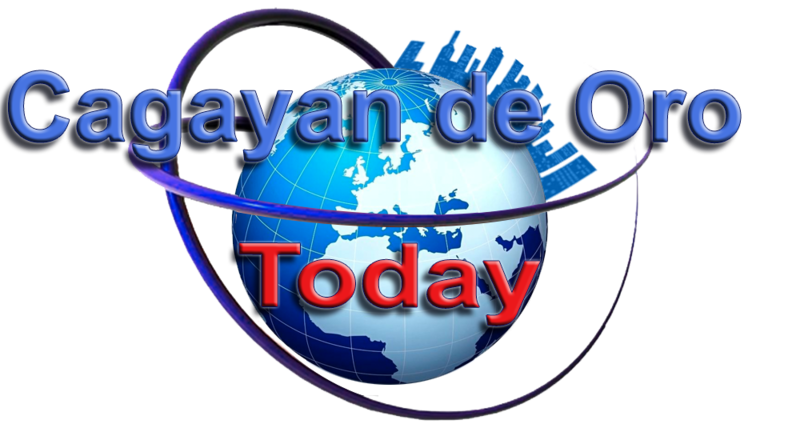 Lapasan–Camaman-an Road from Sta. Cruz 1 to Natasha & BDO Building of Limketkai Complex including Grand Caprice, Parasat and Bagong Lipunan. 4. Agora Market City area including Gaabucayan Extension and portion of Lapasan particularly Sto. Nino, La Paz 1, Tabaco and Savemore.